Saving up for that new John Deere tractor? This charming savings bank will have you on your way to ownership in no time. Solid, sturdy polyresin combined with fired decals make this a must-have addition to any collection. 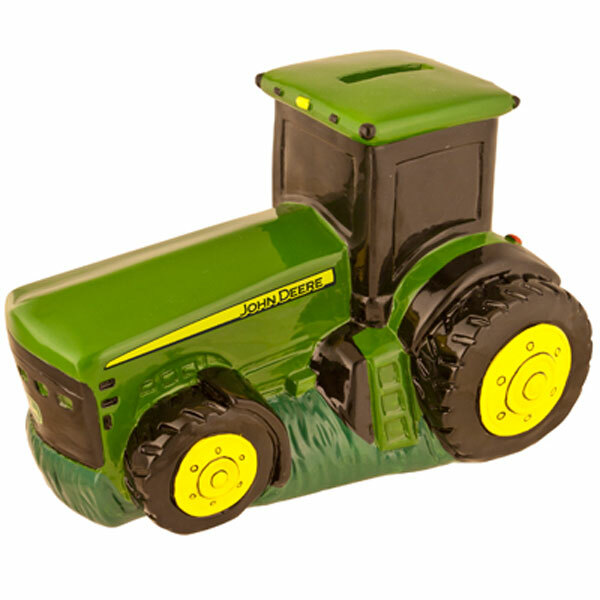 This poly-resin bank features a tractor in classic John Deere green color sitting in grass. The slit for coins is on top of the tractor's cab. A fun piece; different than the typical pig-style bank. John Deere Tractor Savings Bank. Nice item, purchased for my 5yr old son who's obsessed with John Deere stuff. He likes it alot and I'm glad I bought it. Bought this for a BD gift - really well made & so cute . Was a hit with all !